This cartoon monk character holding a beer mug was created as a mascot for a St. Patrick’s Day promotion by national chain of Irish-themed sports pubs, Tilted Kilt. I was approached by the marketing director who found and liked my cartoon illustration of a monk leaning on a beer keg, and wanted something in the same style, but of course their own original character. The character was nicknamed “St. Practice” by the client, as the concept behind the promotion was to get beer drinkers into the pubs to “practice” for St. Patrick’s Day. We went through a few rounds of sketches and revisions to get the character just right. In the end the client was extremely pleased with the final artwork. 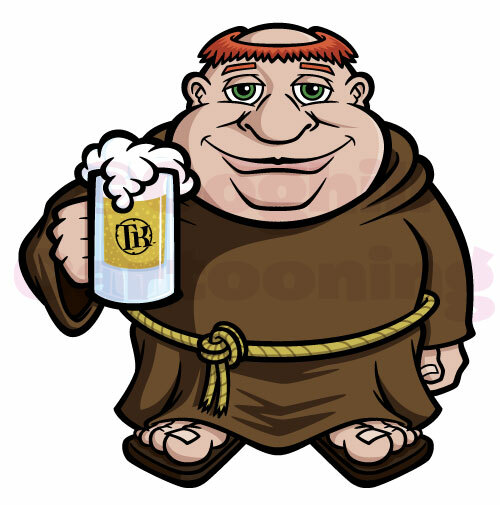 I would like to use this character on a sign i’m in the process of designing for a local pub, can I use it or do you have a similar monk i can use? This art is not available, but I can create an original for you.